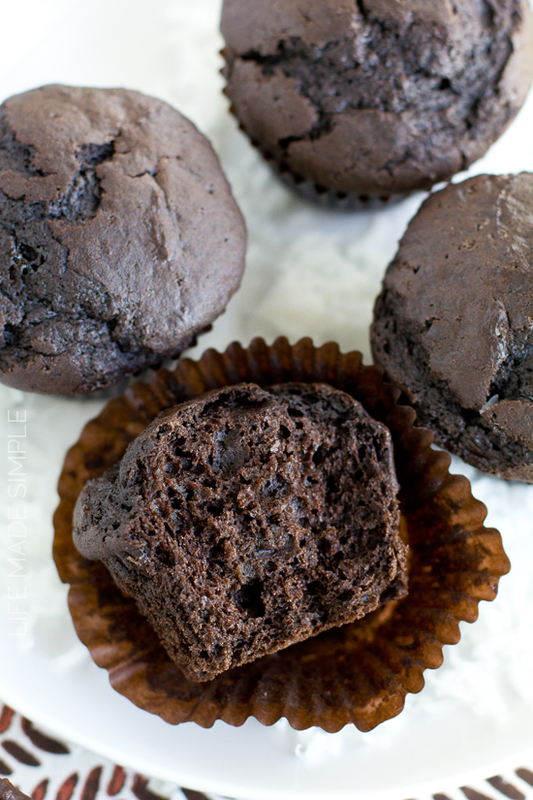 I could rant and rave about these chocolate coconut muffins all day. They are hands down one of the BEST chocolate muffins I’ve ever had! They’re also dairy-free. Back when I was on a no dairy, soy or whey diet, I wanted to develop a few recipes that I could enjoy and that would taste just as good as their dairy counterparts. These muffins became a household favorite. I made them one morning for me and the hubby and was pleasantly surprised by how rich, moist and decadent they were. We both gobbled them up that day. Then a few days later I played around with the recipe a bit and added coconut and dairy-free mini chocolate chips. They were even better! Once I had perfected the recipe I was asked by friends and family to keep making them. No joke, I probably made at least 7 batches that month. As you can tell by the pictures the ones above and below are without the mix-ins. I should have snapped a few pictures of the ones with coconut flakes and chocolate chips, but they were gone before I had the chance. You’re not alone if dairy-free baking scares you. I was terrified at first. I wasn’t sure about all of the substitutions and how they’d affect the texture, flavor and rise of my baked goods. But after trying out a few recipes I quickly got the hang of it. To get started, you’re going to want to mix the oil and the sugar together, beating it for a few minutes much like creaming butter and sugar. Then add the coconut milk and coconut yogurt. I used the kind of coconut milk you’d drink or use with cereal, but culinary coconut milk works just as good… it just depends on what you are able to find. In order to keep this recipe dairy-free I used cultured coconut milk. It’s basically a dairy-free version of yogurt. It’s got great coconut flavor and adds moisture to these muffins. Coconut flavored Greek yogurt is a great substitute for this. After those ingredients have been mixed in, add the egg. 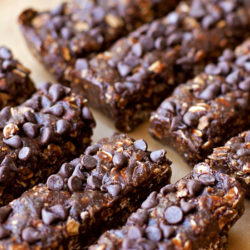 Sprinkle in the coconut flakes, gradually add in the dry ingredients and then fold in the chocolate chips. 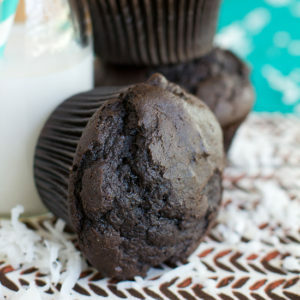 Let them bake for 18-20 minutes and then you’ll have yourself a fresh batch of these incredible chocolate coconut muffins! They’ll become a family favorite in no time, I promise! 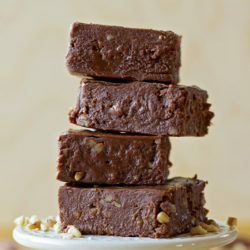 Enjoy and happy dairy-free baking! 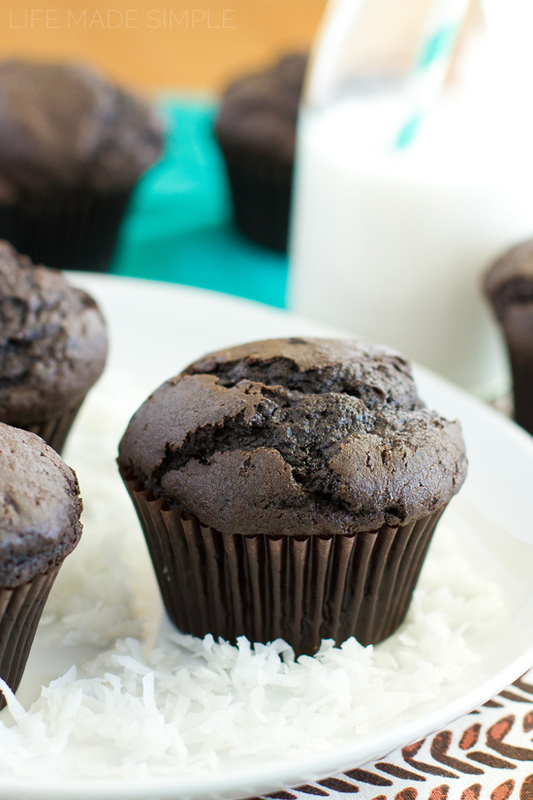 These rich and moist chocolate coconut muffins make a perfect breakfast treat. You'll never guess that they are dairy-free! Preheat oven to 400 degrees. Line one muffin tin, set aside. In a large mixing bowl or the bowl of a stand mixer, combine the sugar and oil. Beat on high for 2 minutes. Add the coconut milk and coconut yogurt, mix until combined. Add the egg and coconut flakes, mix until combined. 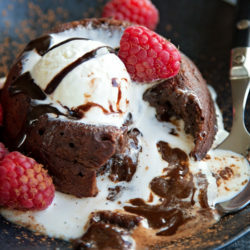 In a separate mixing bowl, combine the flour, cocoa powder, baking powder, baking soda and salt. Whisk the ingredients together. Gradually add the dry ingredients to the wet ingredients. Carefully mix until the batter is smooth and no flour pockets remain. Fold in chocolate chips if desired. Using a large scoop, fill each liner (I use a #20 scoop which as approximately 3.5 tbsp.). Place in the oven to bake for 18-20 minutes. Remove from oven and allow to cool in the pan for 5 minutes before transferring to a wire rack to cool completely. -This recipe was intended to be dairy-free, however with the substitutions listed next to the ingredients, it can be non dairy-free as well. 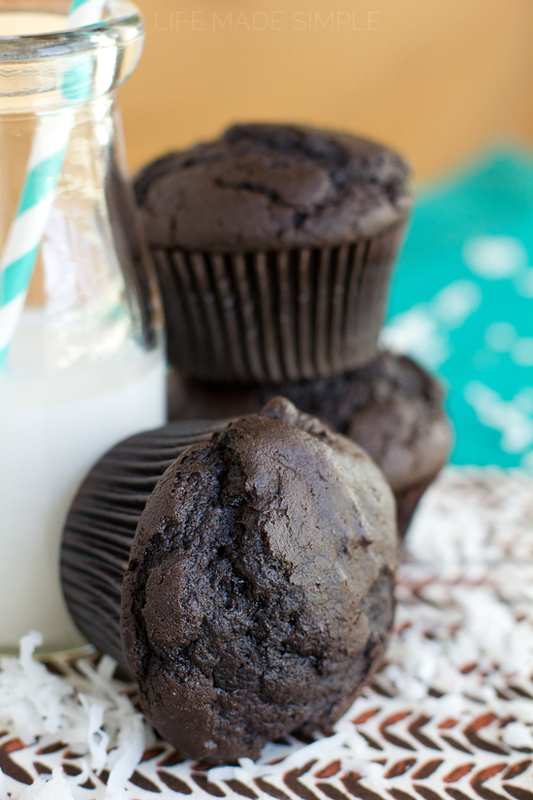 Please note that the coconut oil and milk help add to this muffin's overall flavor.